Sometimes the best gifts come at the most unexpected times. This past weekend I hopped a plane over to Chicago (my first time in Chi-town!) to reunite with a few long-time-no-see friends. After landing, on the ground, I pretty much didn’t stop — after all, with only a day an a half on the ground and so much to see, there was no time to waste! We wandered downtown north and south, east and west, familiarizing ourselves with what it means to be a big-city dweller, or at least a visitor. I don’t think of myself as a small-town girl, but waking up to a city skyline and walking down the Mag Mile with thousands of other people sure made me feel like one. With pine garlands draped on every door way, little red berries intertwined with white glittering lights, and firetrucks dressed up like Santa’s sleigh, I couldn’t help but hum Christmastime In The City to myself the entire day. We made an obligatory stop at the Christkindlmarket to gawk at hand-carved ornaments and I attempted to convince everyone that we should spend the rest of the day making Stollen (I did not succeed…). But best of all, we ran into another friend, making our reunion trip complete! No mug of mulled wine, no ornate gingerbread house, and no stollen could’ve been as sweet as that. Chicago reunion: a merry merry success. It’s been only a few hours since I left, ducking out of our AirBNB before the other girls were still asleep to catch my plane, but I’m already almost home. A little bit groggy and a lot a bit hungry, I’m ready to walk in my front door, open the fridge, and eat all of the leftover Butternut Squash Lasagna in the fridge! Seriously guys, this dinner is one of those “like home on a plate” dishes, and will nourish your soul. And after running around the big city, sky risers and all, the only thing I could really go for is a home cooked meal made with wholesome, flavorful ingredients. Now… fingers crossed that there will still be some when I get there! Lasagna is one of those dishes I always want to have time to make, but never have time to make. Slow cooker to the rescue! Heat the coconut oil in a large skillet over medium heat. When hot, add the beef to the skillet and cook into crumbles, until browned. Meanwhile, cut the butternut squash: I use just the top section of the squash (I choose a squash with a wide neck), chopping off the round part for another dish. Peel what remains of the squash, then slice the neck of the squash vertically into thin (1/4 centimeter) “lasagna noodles”. Divide your squash noodles into 4 equally sized piles. Make the lasagna: Spread 1 cup of marinara sauce in the bottom of the slow cooker. Using one of your sets of squash noodles, make a single layer,fitting them in like a puzzle over the sauce. 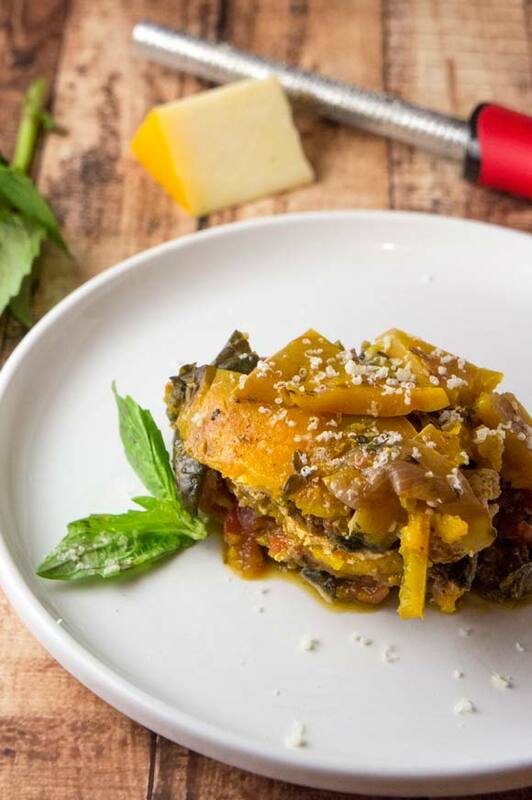 Using a spatula, spread 1/3 cup of ricotta over the squash layer. Next, spread about 1/3 of the cooked beef in an even layer, and finally add a layer of frozen spinach — about 2/3 cup. Repeat those layers (1 cup sauce, squash noodles, 1/3 cup ricotta, beef, spinach) until you are out of beef, cheese, sauce, and spinach. Use your last set of butternut squash noodles to on top of the lasagna to finish the casserole. Season lightly with salt & pepper. Cook on high for 6-8 hours. Butternut should be cooked through. Top with freshly grated parmesan and serve hot.